If you're working in the shared repository model, we recommend that you use a topic branch for your pull request. While you can send pull requests from any branch or commit, with a topic branch you can push follow-up commits if you need to update your proposed changes. When pushing commits to a pull request, don't force push. Force pushing can corrupt your pull request. After initializing a pull request, you'll see a review page that shows a high-level overview of the changes between your branch (the compare branch) and the repository's base branch. You can add a summary of the proposed changes, review the changes made by commits, add labels, milestones, and assignees, and @mention individual contributors or teams. For more information, see "Creating a pull request." Once you've created a pull request, you can push commits from your topic branch to add them to your existing pull request. These commits will appear in chronological order within your pull request and the changes will be visible in the "Files changed" tab. Other contributors can review your proposed changes, add review comments, contribute to the pull request discussion, and even add commits to the pull request. After you're happy with the proposed changes, you can merge the pull request. If you're working in a shared repository model, the proposed changes will be merged from the head branch to the base branch that was specified in the pull request. For more information, see "Merging a pull request." Tip: You can squash commits when merging a pull request to gain a more streamlined view of changes. 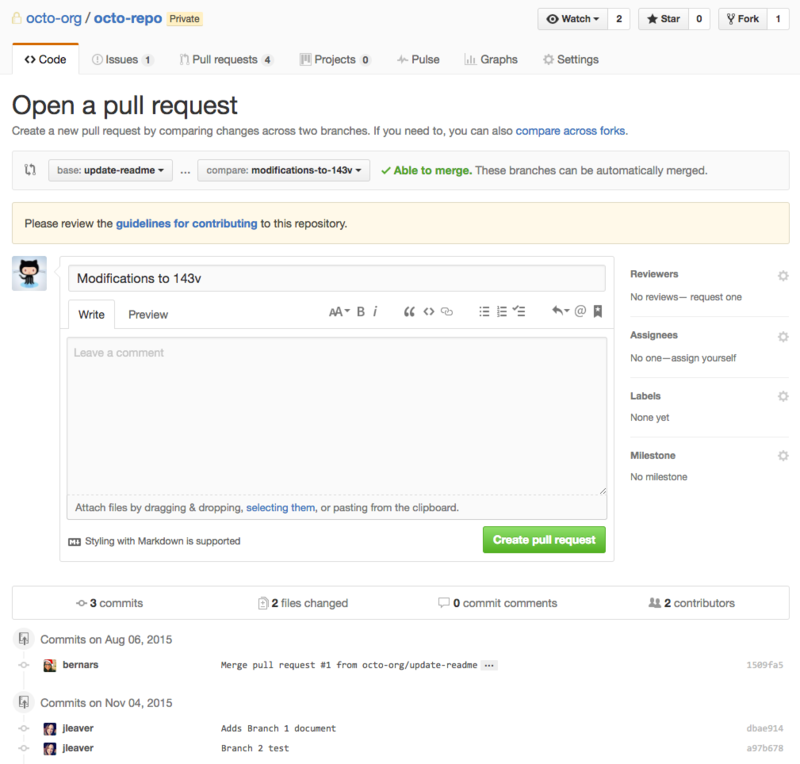 For more information, see "About pull request merges."